We provide the nordic countries best Sommelier education that comes in two steps and is thought in swedish. Our Sommelier education is held in swedish and comes in two steps. In Step 1, you get a basic knowledge of wine, spirits and beer. The program includes one semester with eight training sessions, with a full day lecture every two weeks and home studies. Step 1 ends with a written test. If you proceed to Step 2, you can look forward to a real deepening of your knowledge. We work with a number of additional important areas, and greatly increase your knowledge of the subjects you studied during Step 1. After completing the education, you will finally bear the title of Sommelier with pride. Step 2 ends with a written and oral examination, as well as a blind testing which after approval grants you the Sommelier titel. 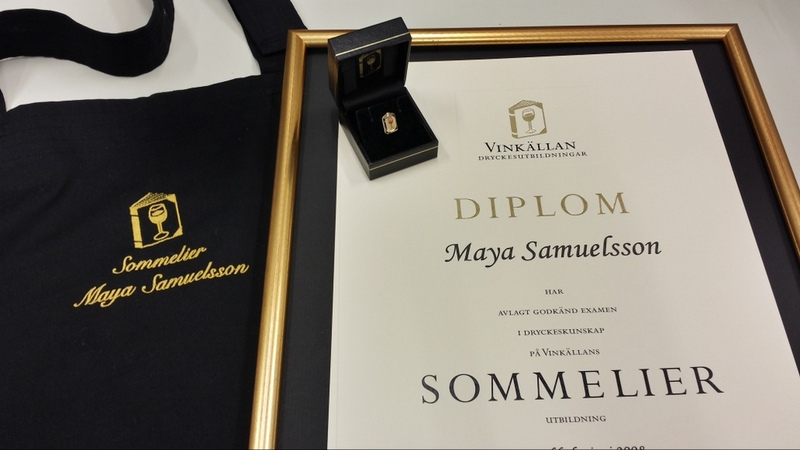 You get the Scandinavian Wine Academy’s diploma, pin and apron with your name in gold embroidery. Scandinavian Wine Academys Sommelier pin, diploma and apron. Ever since our chef Stefano Catenacci read his sommelier education at SWA they have been the obvious school for us as a first class restaurant.